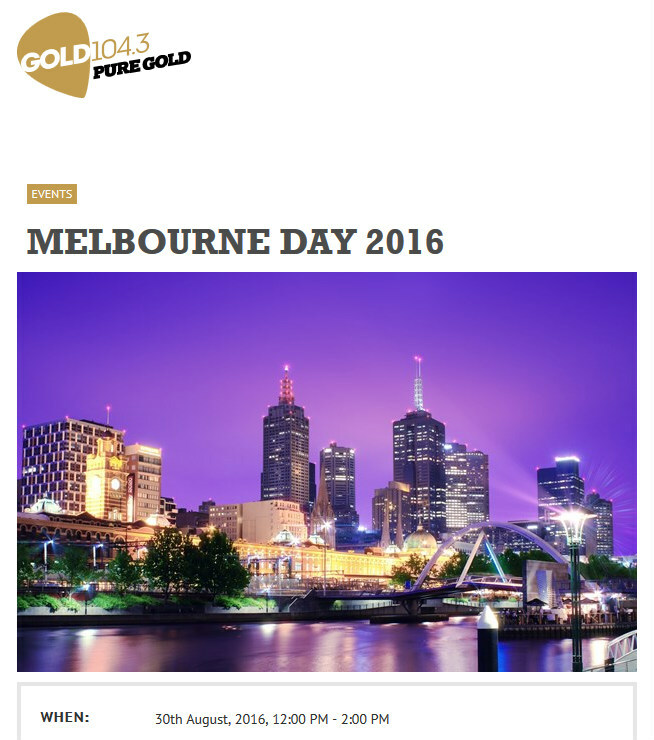 Stay up to date with all things Melbourne Day. Show your love. Follow Melbourne Day. 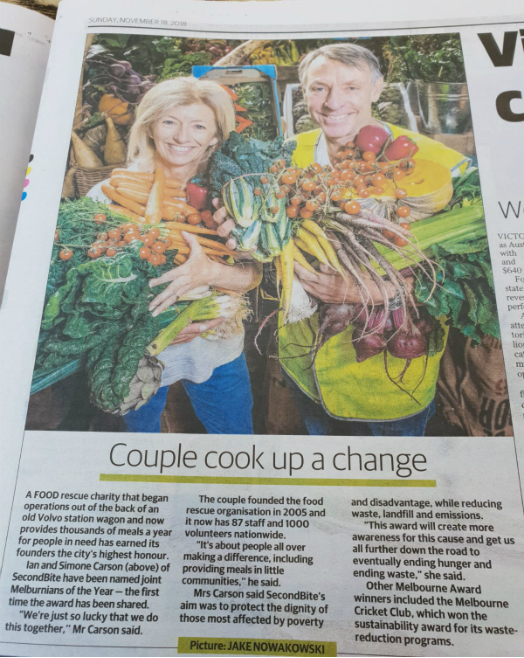 Simone and Ian Carson — the philanthropic duo behind SecondBite, which gives food to people in need — won Melbourne's highest accolade. They were announced winners at the annual Melbourne Awards Gala Ceremony at Town Hall on November 17. Now a national organisation, SecondBite has delivered, since starting in 2005, food for more than 100 million healthy nutritious meals and this year is on track to deliver food for over 40 million meals. 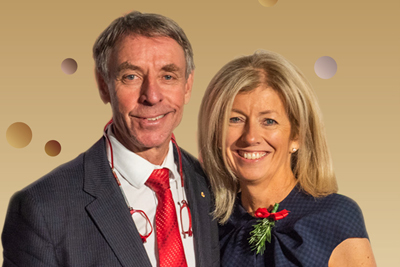 Lord Mayor Sally Capp said: "I'm thrilled Simone and Ian Carson have been awarded our city's highest accolade and named Melburnians of the Year." "The Carsons are incredibly deserving winners and have contributed an enormous amount to under privileged people in Melbourne. When they first started SecondBite in 2005, it was run by three volunteers in Victoria and moved just over 600kg of food a year. "Since then, it has grown at an astounding rate and recently reached a milestone of 50 million kilograms of food rescued and redistributed for people in need across Australia," Cr Capp said . Simone Carson AM said SecondBite's purpose has never changed. "Our aim is to protect the dignity of those most impacted by poverty and disadvantage, while at the same time reducing waste, landfill and emissions," Mrs Carson said. "This award will create more awareness for this cause, and get us all further down the road to eventually ending hunger and ending waste," said Simone Carson. A number of other organisations were also honoured as part of the awards. 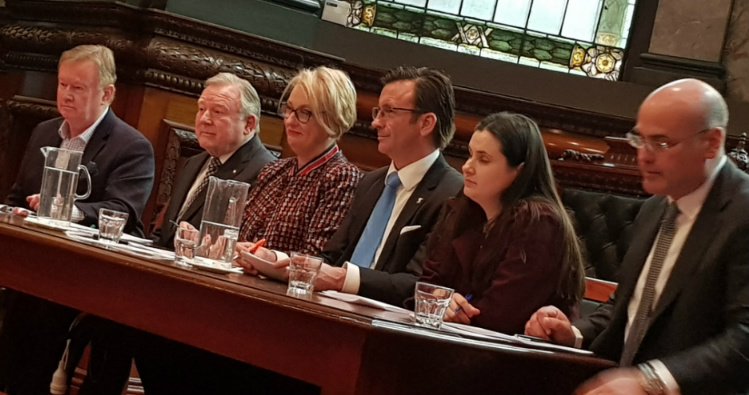 "It is fantastic to be able to celebrate the achievements of so many people working for organisations that are making Melbourne a better place to live and visit," the Lord Mayor said. MPavilion is a cultural hub that promotes and profiles Melbourne as Australia's creative capital and international design destination. The Club Melbourne Ambassador Program is an invitation-only group of Melbourne's elite thinkers and leaders, who work together voluntarily to establish, secure and host international business events to promote our local expertise around the world. Laneway Learning Pty Ltd has countless health and wellbeing benefits that empowers Melburnians to share their passions and become lifelong learners through fun, accessible classes. In Harmony with Health has brought 20 years of music therapy joy at the Royal Melbourne Hospital. The service provides more than 2,000 music therapy sessions at the patient's bedside each year, bring happiness and improving people's quality of life. The Water Well Project is an Australian not-for-profit and registered health promotion charity that aims to improve the health and wellbeing of migrants from refugee backgrounds. A Chinese translating and interpreting company that has for 26 years provided critical links for businesses and governments engaging with China and the Chinese community in Australia. Melbourne Cricket Club has invested significantly in sustainability, introducing a new waste management policy including an innovative organics dehydrator. For their work founding renowned Melbourne non-profit organisation SecondBite. Melbourne Day Committee thanks everyone involved: those who entered, teachers, parents, the judges, City of Melbourne staff, Cr Capp, partners and supporters. 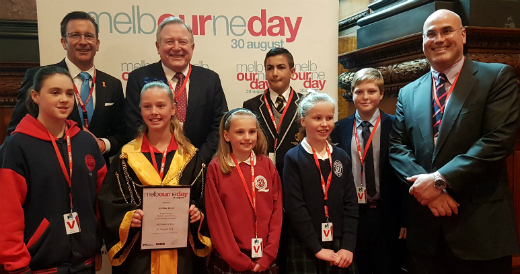 2018 Lords of cool (L to R): Alicia Gec, 10, Taylors Lakes Primary School, Taylors Lakes; Ned Capp, 12, Carrum Primary School, Carrum; Chloe Shovelar, 12, Mentone Girls' Secondary College, Mentone; Freddie Tremlett, 12, Christ Church Grammar School, South Yarra; Chloe Amalfi, 12, Genazzano FCJ College, Kew (2018 Junior Lord Mayor); Joshua Elliott, 11, St Louis de Montfort's School, Aspendale; Isabella Di Natale, 10, Stella Maris Primary, Point Cook. It's sweet sixteen for Melbourne Day. Celebrations marking our city's birthday make it in the top 40 Australian arts and cultural festivals of 2018 list compiled by FlightNetwork, an airline ticket specialist. Melbourne Day committee member Claude Lombard was recognised in the Australia Day 2018 honours for service to the printing industry and to the community. 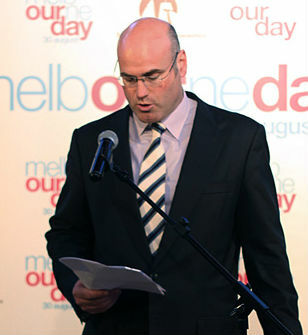 Claude is managing director of Lombard The Paper People, an Australia Day Ambassador for many years and a former director of Melbourne Tourism Authority. He has spent almost 50 years building his family business into a formidable stable of Australia’s best-known packaging, party and marketing houses, and is now involved with almost every major event in Australia. He has made huge inroads into business and the community through a determination to make the public feel included in special events and celebrations, including the Spring Racing Carnival, AFL and now Melbourne Day. 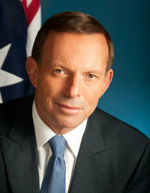 He received an Order of Australia Medal (OAM) in the general division. 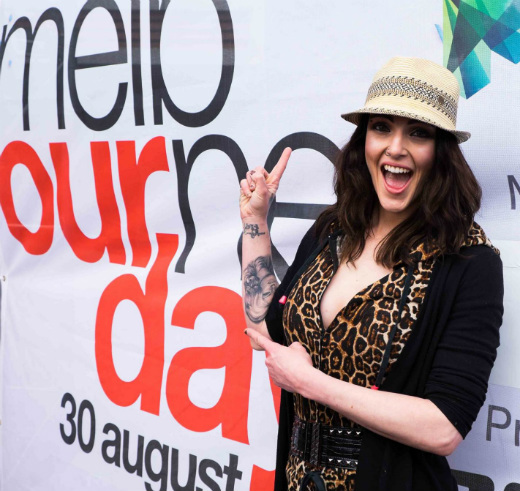 It's Our Day: Performer Peta Evans-Taylor was a crowd favorite on stage. 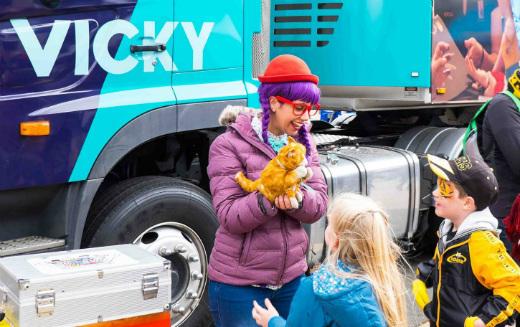 Family festival: Roving performers, face painting and Vicky the Truck kept kids of all ages entertained. What rain? 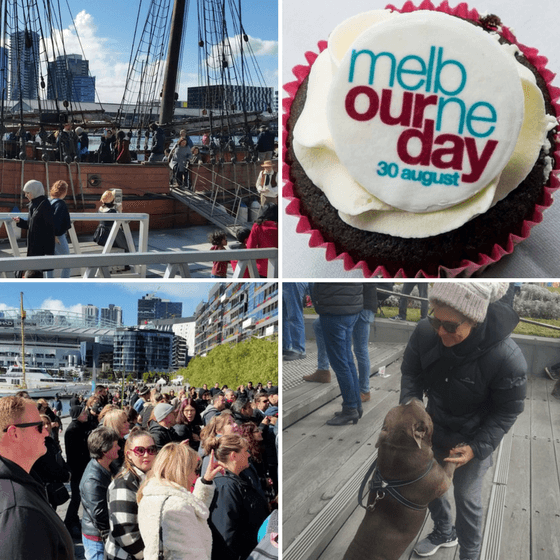 The weather cleared and the Enterprize lowered her gangplank for free tours (top left), cupcakes stole the show, the crowd sang "Happy Birthday, Melbourne" (bottom left) and pets pleaded: "C'mon, gimme a cupcake, woof!" We rocked, Melbourne: Brian Mannix in full flight, Junior Lord Mayor Sienna Koop, Stan Dryden Jnr with indigenous art, the Enterprize Re-enactment Crew. 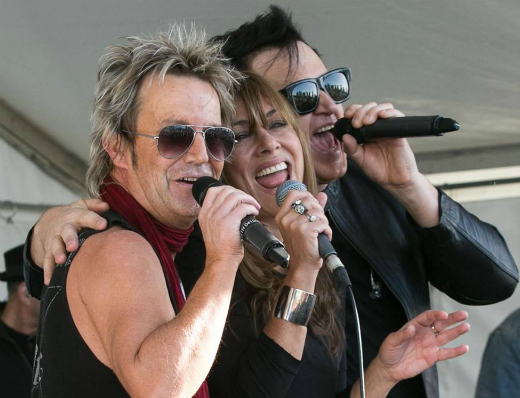 We raised the Melbourne flag, quickened pulses and filled hearts with pride at Enterprize Park on 30 August. "All around us, spanning centuries, history shaped the city that was given the name Melbourne," said Acting Lord Mayor Arron Wood. 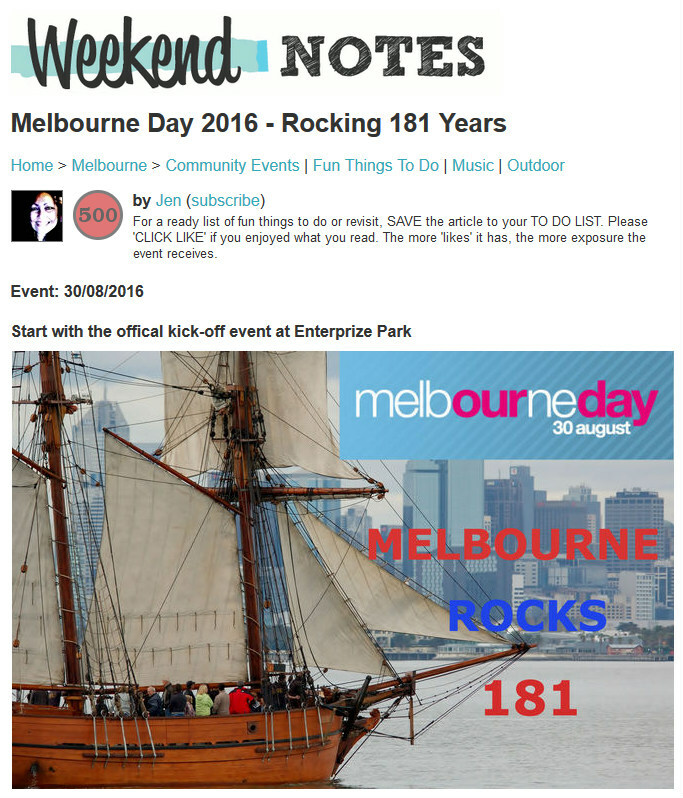 "Melbourne Day is a time to reflect - on our Aboriginal history and on the years after 1835. This is a time to celebrate the Melbourne we have become," Cr Wood said. The 2017 Junior Lord Mayor, Sienna Koop, from Aspendale’s St Louis de Montfort’s School, called for better transport links to Tullamarine airport. Neil Mitchell broadcast live his 3AW program from the banks of the Yarra River. Acclaimed Aboriginal artist Stan "Yarramunua" Dryden held a Welcome to Country and called for all Melburnians to be proud of their city and not to change historical monuments amid a national debate on the issue. The big band sound of much-loved Victoria Police Pipe Band shook the pylons of the wharf at Enterprize Park. Melbourne's "first settlers", the Enterprize re-enactment crew in period costume - including Gilbert, the Tassie tabby, our city's first cat - stole the show. Our roving town crier was in full voice. 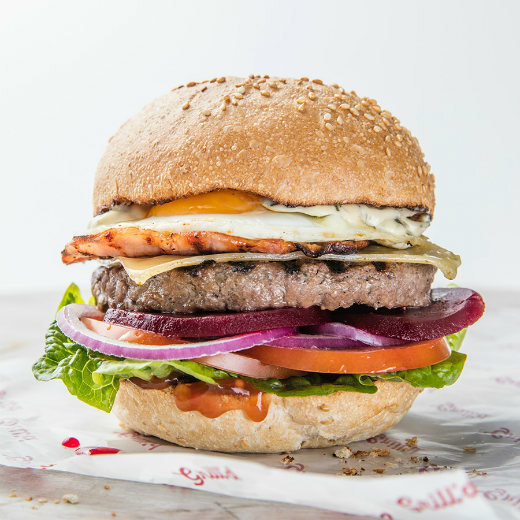 If you bought a Mighty Melbourne burger on Melbourne Day, Grill'd donated one to those sleeping rough in our community. One for one, on Melbourne Day. Grill’d partnered with Melbourne City Mission, the Salvos and St Vincent de Paul to ‘pay it forward’. Every Mighty Melbourne Burger sold was paid forward and Grill’d will close the doors of its Southern Cross Station restaurant, inviting those sleeping rough to come in for dinner. Melbourne Business Network held a Cocktail Soirée where the Melbourne Day Oration was delivered by Lord Mayor Robert Doyle on the topic of "Doing business in the World's Most Livable City". Where: The Trust, 405 Flinders Lane, city (rear of Immigration Museum and adjacent to the old historic Port Building in Flinders Lane). Royal Historical Society of Victoria's annual Melbourne Day lecture, delivered by Emeritus Professor Richard Broome, traced the development of Melbourne from an Aboriginal place to the colonial hub, in succession, of a sheep walk, a golden field of wealth, and an urbane modern metropolis. It focused, in particular, on the latter European phase, asking why and how did Melbourne grow so ‘marvellous’. It covered the despair the city fell into during the 1890s. The lecture also explained how the RHSV created, devised and produced the best-selling book Remembering Melbourne, which completely sold out and was re-launched on 30 August. If ‘Marvellous Melbourne’ was the product of a particularly rampant individualism based very much on money-making through property, the creation of Remembering Melbourne was the outcome of a rampant communalism and the spirit of volunteering. If avarice created a city, altruism has recorded it. Prof. Broome taught Indigenous and Australian history at La Trobe University for more than 30 years. He is a RHSV councillor and patron of the History Teachers’ Association of Victoria. Richard is the author of dozens of articles and 12 books including Aboriginal Australians. A History since 1788 (2010) in four editions and the award-winning Aboriginal Victorians. A History since 1800 (2005). He has edited (with others), Remembering Melbourne 1850-1960 (2016), and the journals Australian Historical Studies and the Victorian Historical Journal. His latest book is with Visier Sanyü, Naga Odyssey (September 2017). His next book (with three others) is Mallee Country. Land, People, History (forthcoming). Royal Historical Society of Victoria's Standing on the Corner exhibition shows how Melbourne’s street corners have been used for more than 110 years. We taken them for granted but before the internet, they often were the "village square", reflecting the soul of their local community. This exhibition captures the city's corners as they were, with supporting maps of the city from 1850 to 1960. When: Open daily until 20 December, 2017. Times: 10am to 4pm Monday to Thursday and Saturday, 10am to 3pm Friday. Venue: Royal Historical Society of Victoria, 239 A’Beckett Street, Melbourne. Enquiries: office@historyvictoria.org.au or phone 9326 9288. SHE Talks: "My Big Idea"
In a TED-style talk, eight women shared their BIG IDEA that entertained, stimulated, even shocked and most definitely provided a spark to take home! SHE Talks is helping shape Melbourne through events that bring diverse individuals together, through the sharing of conversations, ideas and working on projects as a team. Media partners radio 3AW and GOLD104 FM had lots of great give-aways in the run up to Melbourne Day. Prizes included an illy Australia coffee machines, AFL Elimination Final tickets, thanks to The Ticket Merchant, and a table to next year's Channel 9 AFL Footy Show! Life begins at 183! Get Melbourne Day news straight to your inbox. Little big boss of 2017: Sienna Koop, in mayoral robes, with finalists Abby Vogel (left), Mikayla Barnes, Julian Cugliari (rear), Alexandra Bardsley and Luke Zeliff (not visible). Sienna Koop, 11, was declared the competition winner at a ceremony at Melbourne Town Hall on 24 August, 2017. "I love everything about Melbourne, especially the culture, sights, people, events, activities, festivals and opportunities to get out there and live life to the full," her Worship said. Asked how she would improve Melbourne, she said: "To provide opportunities for the people of Melbourne to have a say on how to make Melbourne even better than it already is." She was chosen by a panel of judges, including Acting Lord Mayor Arron Wood, Radio 3AW presenter Denis Walter, Channel Nine newsreader Peter Hitchener, 13 CABS' Head of Client Services Simon Purssey and Melbourne Day Committee chairman Campbell Walker. It is back-to-back wins for St Louis de Montfort's, after the school's captain, Mason Dwyer, won the competition last year. The competition, now in its fifth year — for students in grades five to seven — aims to educate Victorians about the city and its history. 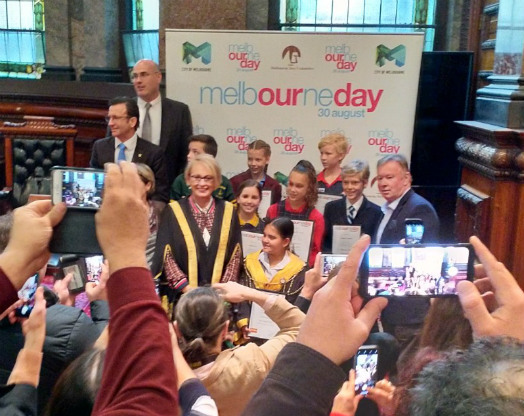 The Junior Lord Mayor gets to raise the flag on Melbourne Day, wins a class excursion to go sailing on the Enterprize, joins city councillors and Lord Mayor Robert Doyle on official and other fun duties during the year and more! Top marks: Judges Simon Purssey from 13CABS (back left), Channel Nine newsreader Peter Hitchener (back), Melbourne Day Chairman Campbell Walker (right), Acting Lord Mayor Arron Wood (not pictured), radio 3AW presenter Denis Walter (not pictured) and finalists (L to R) Abby Vogel, Sienna Koop (Junior Lord Mayor winner in mayoral robes), Mikayla Barnes, Julian Cugliari (rear), Alexandra Bardsley and Luke Zeliff. 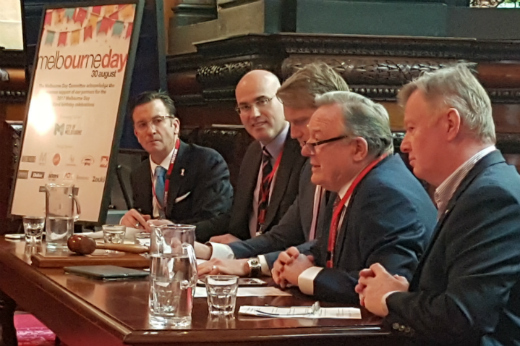 Judging panel (L to R): Simon Purssey from 13CABS, Melbourne Day Chairman Campbell Walker, Acting Lord Mayor Arron Wood, Channel Nine newsreader Peter Hitchener and radio 3AW presenter Denis Walter. No fear: Finalist Luke Zeliff makes his pitch to the judges. Winning formula: Her Worship Sienna Koop gives her first TV interview; with Simon Purssey from 13CABS, the competition's sponsor (bottom left); with judges radio 3AW presenter Denis Walter (left) and Acting Lord Mayor Arron Wood (right). 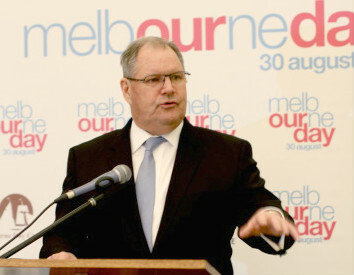 Lord Mayor Robert Doyle in a special Melbourne Day message says the city's birthday is "an opportunity to reflect on all that our diverse community has achieved". "With an aboriginal population that dates back thousands of years, many waves of migration and a bold, modern city, we have much to celebrate together," Cr Doyle says. "The official flag-raising ceremony at Enterprize Park on 30 August marks a significant point in our shared history as a community that came to be known as Melbourne. "In addition to the formalities, we invite you to celebrate all that unites us at a free family festival at Victoria Harbour, Docklands on Sunday, 27 August. Highlights include a free ‘Absolutely 80s’ concert, Welcome to Country, Sunday Docklands Market and of course, a giant birthday cake. "In 2017 Melbourne again won the title of the World’s Most Liveable City, for a record seventh year, adding to our global reputation as a friendly, inclusive, diverse and welcoming city. "In this spirit I wish you all an enjoyable Melbourne Day." 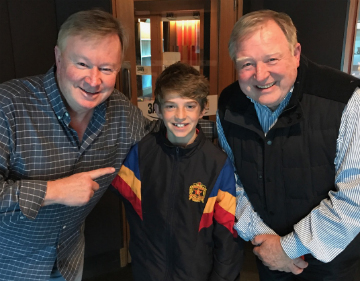 On air: Junior Lord Mayor 2016 Mason Dwyer at radio station 3AW, with Channel Nine news presenter Peter Hitchener, right. Mason was a guest on the Afternoon show, hosted by Denis Walter, left, on 6 June 2017. 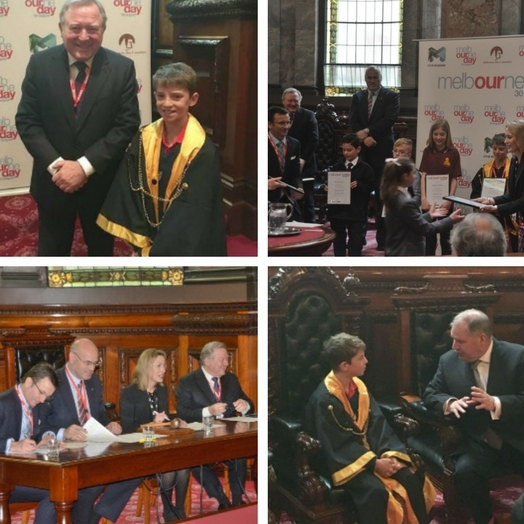 His Worship declared open the 2017 Junior Lord Mayor Competition, urging students across the state to enter online and learn about Melbourne. 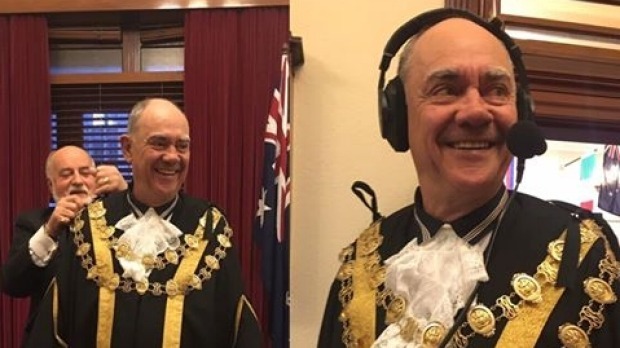 Mason Dwyer tells radio 3AW that being Junior Lord Mayor is fantastic, giving speeches is fun and wearing mayoral robes "makes you look and feel more special than you are." He appeared on the Afternoon show, hosted by Denis Walter, and was interviewed by Denis and Channel Nine news presenter Peter Hitchener, one of the competition judges. Peter Hitchener said Melbourne Day was "probably the most important date on the calendar" for Melburnians. He said last year' s finalists were "unbelievable, amazingly articulate, they had a very clear vision of the world and what they want to do ". Mason urged students to enter, saying it's a fantastic role and "would look great on your resume". Denis asked Mason if he still had time to do schoolwork among the official civic duties. "I've managed to fit it all in," His Worship smiled assuredly. If there's one interview you listen to all year, make it this one! Mason Dwyer, 11, is the 2016 Junior Lord Mayor of Melbourne. He was the outstanding candidate from six excellent finalists. The school captain from Aspendale’s St Louis de Montfort’s School is a keen environmentalist, loves the city's architecture, its landmark buildings, food and people. He barracks for AFL side St Kilda, is a keen runner, and he's a recycling and environmental advocate. His big ticket is fixing Melbourne's homeless issue. "Homelessness is a problem the world faces, not just our city. I'm here to try to help with that," the little big boss of Melbourne told 3AW. His favorite building is the Eureka tower, and he loves Eureka Skydeck. "I want to cure homelessness and make Melbourne a greener city full of grass and trees to make everyone happier, and make Melbourne a better place to live. I want to make the world a better place." 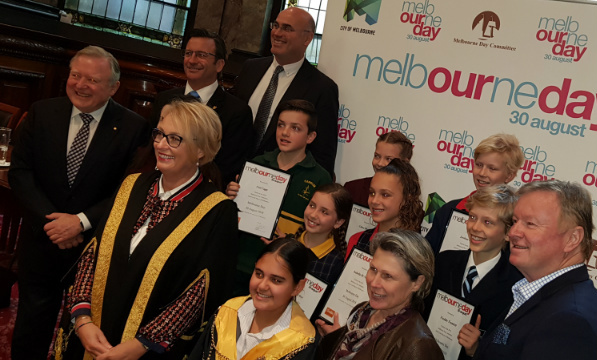 The other finalists were Maximus Debski, from St Mary’s, Ascot Vale; Zaci Zdraveski, Sandridge School, Williamstown; Stephanie Bridges, Menzies Creek PS; Alice Casey, Genazzano College; and Simona Crivelli, Genazzano College. The competition, now in its fourth year, is open to students in grades five to seven and aims to educate Victorians about the city and its history. Top marks: Channel Nine newsreader Peter Hitchener with Mason (top left). Awarding the finalists (top right). The judges hard at work (bottom left). Getting some tips for the year ahead as the little big boss of Melbourne from the big boss, Lord Mayor Robert Doyle (bottom right). Class of 2016: Simon Purssey from 13CABS (back left); Channel Nine's Peter Hitchener; Melbourne Day Chairman Campbell Walker; City of Melbourne's Katrina McKenzie; (front left) Zaci Zdraveski, Sandridge School, Williamstown; Maximus Debski, St Mary’s, Ascot Vale; Stephanie Bridges, Menzies Creek PS; Junior Lord Mayor Mason Dwyer, St Louis de Montforts, Aspendale; Simona Crivelli, Genazzano College; Alice Casey, Genazzano College; and town crier Ian Morrison. Three bosses helped launch Melbourne's Christmas Festival, which began with the lighting of the city's seven metre, 4.5 tonne living Christmas tree at the weekend. 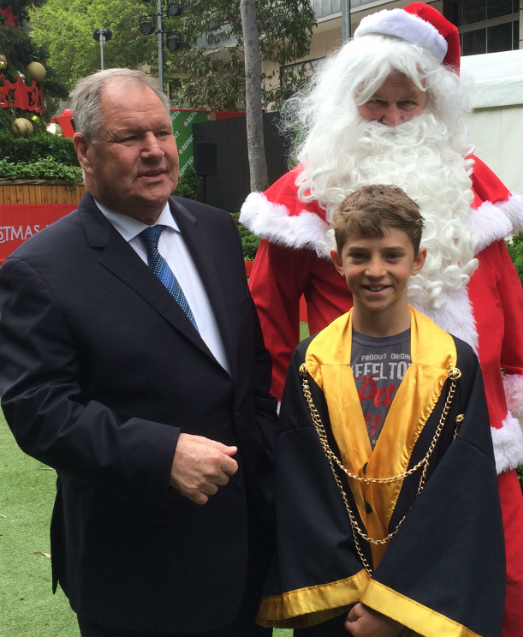 Junior Lord Mayor Mason Dwyer, the little big boss of Melbourne, joined Lord Mayor Robert Doyle, and Santa at a transformed City Square, renamed Christmas Square, to announce a month-long Christmas extravaganza. The tree is the centrepiece of the square that includes a magical forest for children to explore, free activities such as Christmas story time and carols and Santa, who will be in the Square daily to hear gift requests and pose for photos. Melbourne Town Hall and Federation Square will be lit with spectacular light projections nightly until Christmas. Cr Doyle said the variety of retail, hospitality and entertainment offerings in Melbourne makes it the destination of choice in the lead up to Christmas. “Last year we saw 330,000 attendees at Christmas Square and 215,000 spectators of the light projections on Town Hall; that’s more than 7,500 a night," he said. Other festival highlights include the Christmas at The Dock family day out on 10 December and the Christmas Night Markets at Queen Victoria Market which are on each Wednesday night in the lead up to Christmas. Mason, Cr Doyle and Santa answered questions from the media. 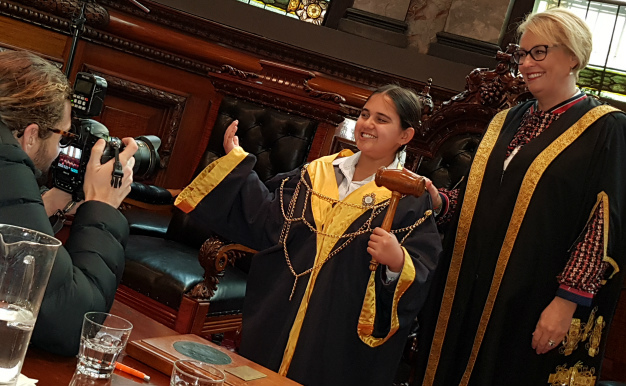 Having won the Melbourne Day Junior Lord Mayor Competition, Mason officiated at Melbourne Day celebrations and is performing fun civic duties during the year. 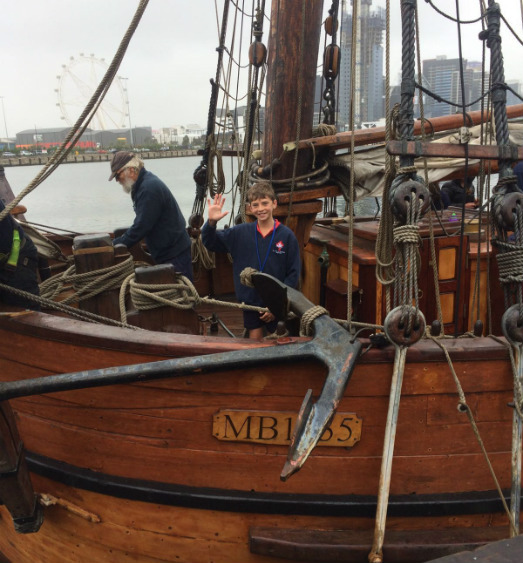 Earlier in the week, Mason joined 110 classmates and teachers from his school, St Louis de Montforts, Aspendale, on a excursion on the Enterprize, the schooner that brought the first settlers to Melbourne. 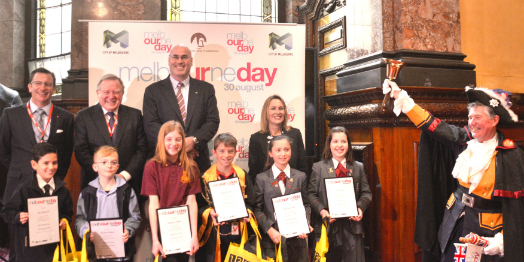 The day out was part of the prize for winning the Junior Lord Mayor competition. The trip included an interactive history lesson involving discussion, playing out scenes, learning about Melbourne’s early history, hoisting sails, steering, and learning about our city's first settlers. Best coffee, pizza now paella.Gracias! Hola, amigo! 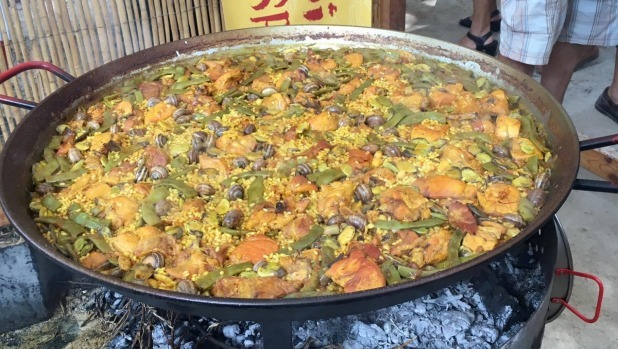 Melbourne's paella made by our city's Simply Spanish eateries is announced as the best in world, outside of Spain! Gracias! It comes as we're still digesting the news that Melbourne is home to the best margarita pizzas in the world. Ciao, bella! Melbourne is the best-a margarita make-a in the world-a! Mama mia! Numero uno, capish? As Melbourne celebrates 181 years, The Huffington Post's Associate Editor Sam McKeith takes the opportunity to acknowledge some of our city's often overlooked talking points. Access all areas: Burnso hands Ross the "key to the city". 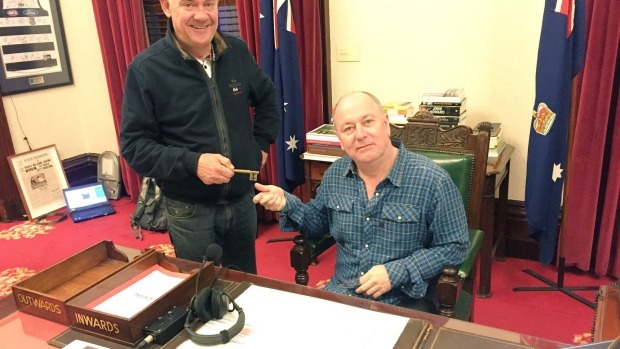 3AW Breakfast's Ross and John took over the Lord Mayor's chambers at Melbourne Town Hall on Melbourne Day. It's a must-watch edition of the The Good Room, a series where the pair broadcast from special locations. Pondered curious items on Cr Doyle's desk, including a sword! Listed little-know Melbourne facts, including laws against trading with pirates and driving a goat afixed to a vehicle. Vote 1, Burnso: Just robes and chain. Skipped the knickerbockers and bell-buckle shoes. Could the world's most liveable city be even better? The Age newspaper's Clare Kermond asks some of Melbourne's creative thinkers to look to the future, to dream big and think about what they would like to see in this town. If the budget were limitless and you could follow your dreams, what would Melbourne look like in 10 or 20 years? 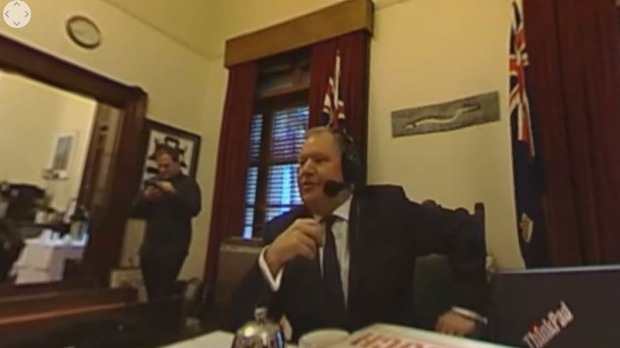 Hear why a former Victorian premier, a pub owner, teachers and spouses get mentioned in this interview with our Chairman Campbell Walker on JOY 94.9 FM's Friday Drive show with hosts David and Sue. 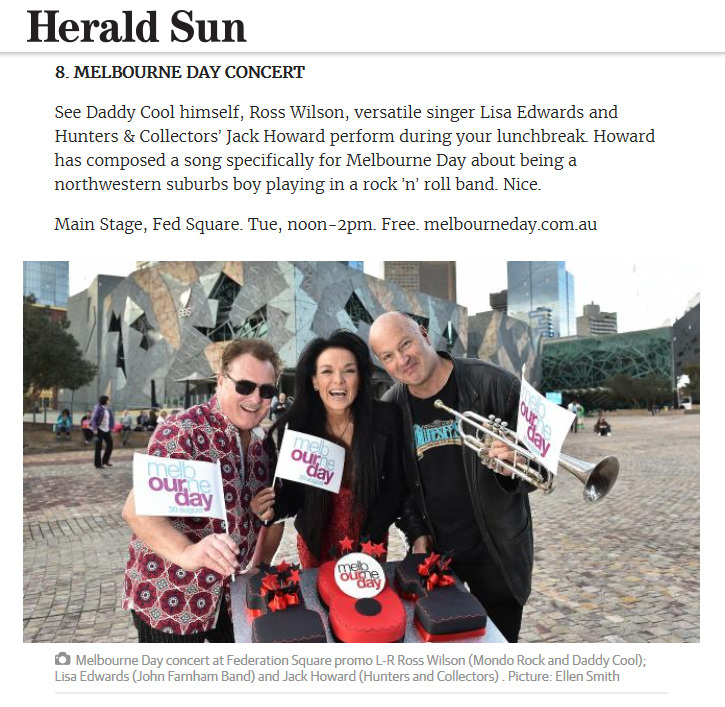 Melbourne Day gets mentioned in the Herald Sun newspaper, 29 July 2016. It might seem otherwise, but Melbourne Day committee member Claude Lombard doesn't work full time for Our Day. His real job is running Lombard The Paper People, Australia's largest independently-owned party-supplies business. And, in between, he still fulfills his Australia Day Ambassador duties. 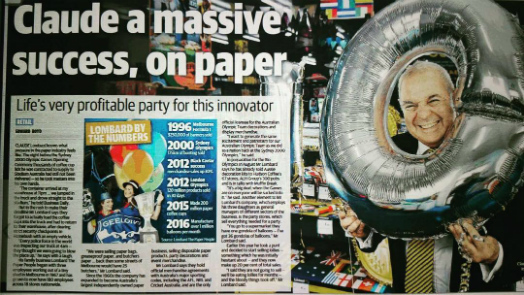 Learn more about our committee's Haberdasher-in-Chief in this News Ltd article, published in the run-up to Melbourne Day and the Rio Olympics. Credits: Music by Bettina Spivakovsky, lyrics by Bettina Spivakovsky, performed by Soli Tesema, live and midi instrumentalists Kit Riley and Bettina Spivakovsky, producers Kit Riley and Bettina Spivakovsky. Produced at Kit Riley Studios (2015). Gold rushes, building booms, industry, innovation and migration have defined Melbourne’s history, and created the modern metropolis we know today. Now a vibrant hub of style, sport, arts and dining, Melbourne is the cultural heart of our nation, and one of the great cities of the world. As you celebrate Melbourne’s 180th anniversary, I offer my warmest congratulations to all its citizens. The 2015 little big boss of Melbourne is Claire McDaniel. 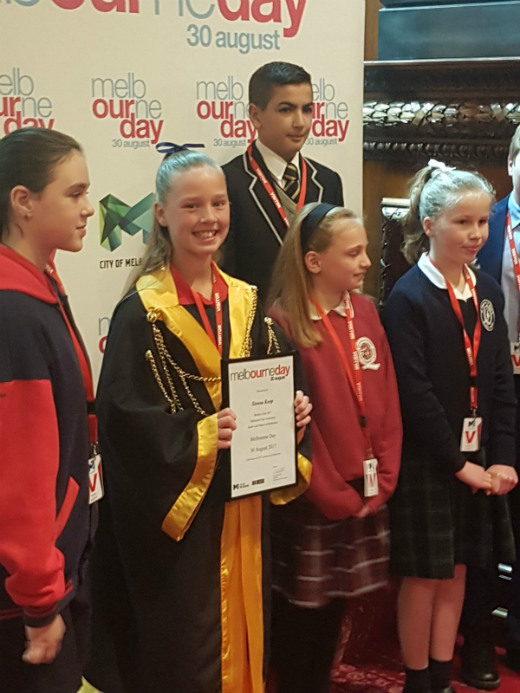 Claire, 12, from Loreto Mandeville Hall, Toorak, won our competition that encourages students in grades five to seven (10 to 12 years of age) to learn about Melbourne history and civic duty. Originally from San Francisco, she moved to Melbourne five years ago, and helped raise the flag on Melbourne Day and joined city councillors and Lord Mayor Robert Doyle on official and other fun duties during the year. Cyber safety is her big-ticket policy, and she's a big fan of our public transport. But is Claire eyeing Cr Doyle's job? "It really depends," she told Tom Elliott on radio 3AW's Drive show. "Maybe sometime in the near future." Claire was the overall winner from six students shortlisted — one more than the stipulated five because of the "high calibre, compelling candidates", the judges said. Thank you to those who entered. We thank 13CABS, our 2015 competition partner. The finalist were Sophie Logan, 11, from Loreto Mandeville Hall; Alexandra Lakkis, 12, Penleigh and Essendon Grammar School; Izzy McGregor, 11, Loreto Mandeville Hall; Melissa Krstevska, 10, Altona Primary School; and Charli Rymer, 10, St Joseph's Black Rock. Claire was interviewed on Drive on 26 August, 2015, the day of her announcement. "She is a very, very interesting, erudite, young lady," Tom said introducing the segment. 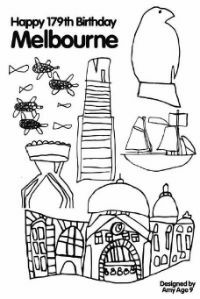 Marcus, 10, in Grade 4 at OLGC Primary School, Deepdene, is the winner of our 2015 competition to design Melbourne's birthday card. "My favorite icon, which I have drawn, is the W-Class Tram," says Marcus. 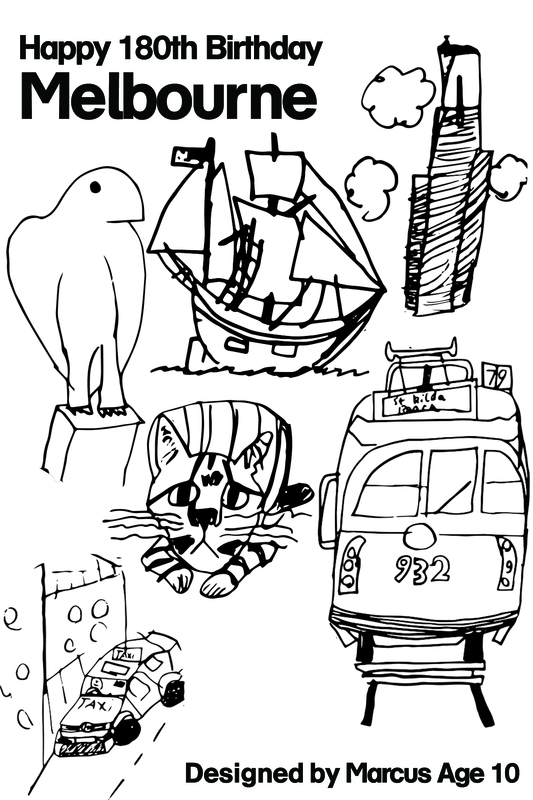 It also features Bunjil, Docklands; Eureka Skydeck; the Enterprize; Gilbert, Melbourne's first cat; and a 13CABS taxi. His card will be on show at Melbourne Day events and other places across town. Colour-in, pin on your fridge or give to friends (with $5 inside, naturally)! On behalf of all Australians, I offer hearty congratulations to the City of Melbourne on the occasion of its 180th birthday celebrations. Melbourne is a wonderful city, a city of many people, many cultures and many backgrounds. It is a city where something is always happening, alive with sport, history, theatre and the arts, and of course a great restaurant or a great coffee is never far away! 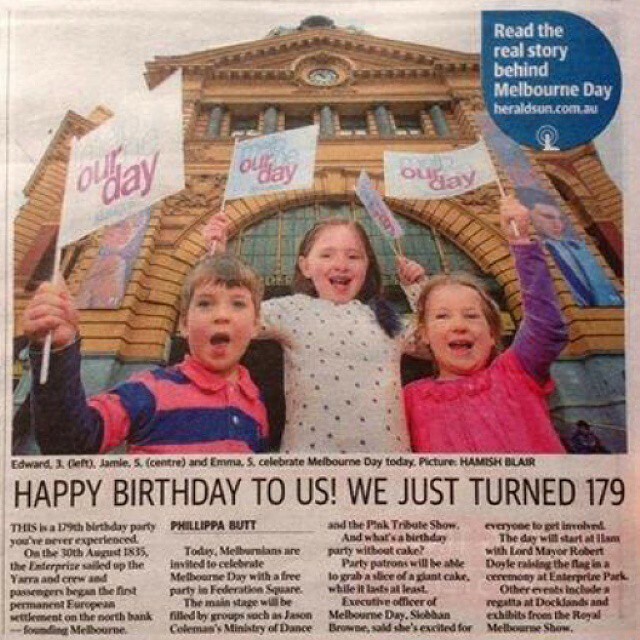 Melbourne's diversity reflects Australia's diversity, and on this day all Australians wish you a happy birthday. On behalf on my fellow Aldermen and the City of Launceston, I am delighted to continue our support and acknowledge Launceston's historical link with Melbourne. On 30 August 1835, the settlement of Melbourne was born when settlers in search of new land set sail from Launceston, Van Diemen's Land (Tasmania) onboard the schooner Enterprize and landed beside the northern banks of the Yarra River. The relationship that has been fostered between our cities from the foundation of Melbourne to today is very special. I am pleased that Launceston continues to play a part in the fantastic Melbourne Day celebrations. 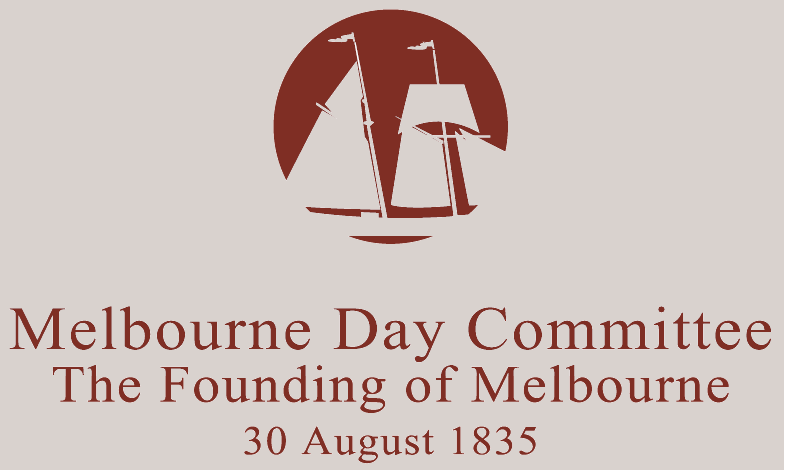 Congratulations to you, the Council and the citizens of Melbourne on your 180th anniversary, as you enjoy a successful and memorable 2015 Melbourne Day celebration. Still Marvellous After 180 Years (PDF) article published in PrimeResource, a magazine distributed to 840 Victorian schools. 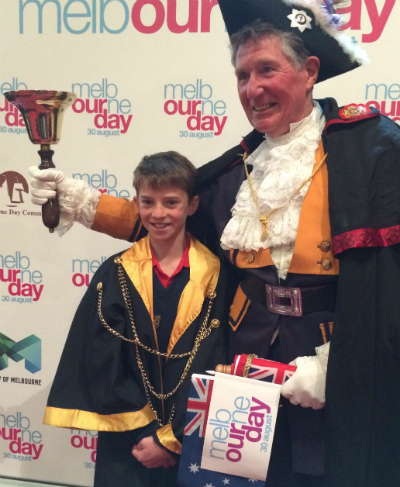 And a finalist in our Junior Lord Mayor of Melbourne competition writes about his experience. HIV researcher Prof Sharon Lewin is the 2014 Melburnian of the Year. Pr ofessor Sharon Lewin is an infectious diseases physician and scientist and is internationally renowned as one of the leading research scientists on HIV and AIDS. 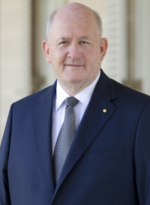 Professor Lewin is the inaugural Director, Doherty Institute for Infection and Immunity at the University of Melbourne and The Royal Melbourne Hospital. Prior to this, she was Head of the Department of Infectious Diseases at Alfred Health and Monash University; and Co-Head of the Centre for Biomedical Research, Burnet Institute in Melbourne. The Doherty Institute has a major focus on diseases that pose serious public and global health threats such as HIV, viral hepatis, influeza, tuberculosis, Ebola virus disease and drug resistant bacteria and hospital associated infections. Professor Lewin’s research focuses on understanding how HIV persists in patients on antiviral therapy, strategies to cure HIV infection and biological determinants of immune recovery following antiviral therapy and the pathogenesis of HIV-HBV co-infection. Professor Lewin was the Local Co-Chair for the AIDS 2014 Conference held in Melbourne in July 2014 – the largest health and development event ever held in Australia, with 13,600 delegates attending from over 200 countries, with Sir Bob Geldof and Bill Clinton as keynote speakers. It was the first time in 10 years since the International AIDS conference was held in the Asia-Pacific. The highly-anticipated event put Melbourne firmly in the international spotlight. Many of the attendees at AIDS 2014 were there entirely due to Sharon’s appointment as Co-Chair and her unrelenting drive to educate and advocate on behalf of the HIV/AIDS community. At the Conference, Sharon was hailed by the International AIDS Society as one of the most influential campaigners and researchers in the world – not an appellation that comes lightly. Professor Lewin is frequently asked to speak internationally and she is passionate about both her work and also Melbourne more broadly. 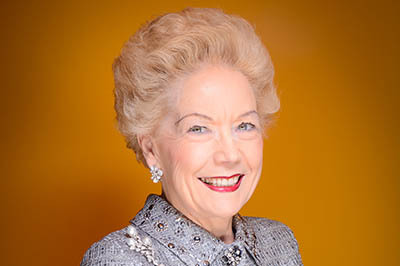 She is an extraordinary advocate for the HIV community, research community and is always ready to promote Melbourne in terms of medical research. To learn more, visit the website of the Melburnian of the Year and Melbourne Awards. And try a $2 Lucky Dip — each one wins! Come see us in Kids Zone (not Woolworths Pavilion as earlier advertised in some places) at the Royal Melbourne Show that runs until 1 October. Our showbag is just $20 but bursting with more than $200 value! See our Showbag's contents. Kids Zone is near Gate 5. Download a map (PDF). Our Melbourne Day exhibit is stop No 5 on the official Show trail. Come learn about Melbourne Day! Get a Super Show Trail Bag from any information booth for $12, follow the trail and collect goodies valued at $140 as you go. A poll to vote for one of three proposed names for a new park in north-west Docklands has closed. 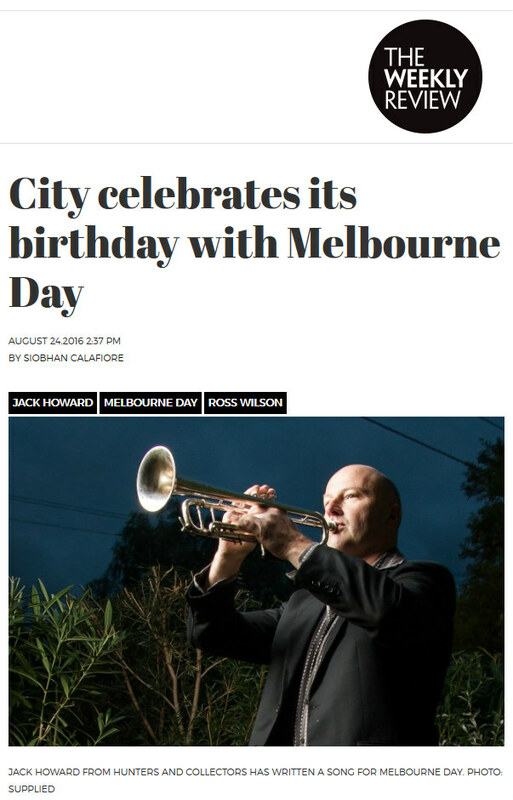 What's the connection to Melbourne Day? One of the proposals is Lancey Park — after Captain John Lancey, one of the first settlers to arrive aboard the Enterprize and start European settlement of Melbourne on 30 August 1835. Captain Lancey was the leader of the expedition, representing John Pascoe Fawkner, the owner of Enterprize. The other proposed names are Ron Barassi Snr Park and Dudley Flats Park. Click here for more information. Watch this space for poll results. Looking for our 2014 program guide? Download it here (PDF). Or read it online magazine-style, click here. What does Melbourne stand for? Melbourne Day Chairman Campbell Walker (right) will help launch an initiative tomorrow to answer that question, and help uncover the values that make Melbourne unique. "Melbourne was founded upon a number of principals that many are unaware of," Mr Walker says. The Melbourne Values initiative is designed to celebrate and foster the city’s unsung values that are ever-evolving and an inherent part of Melbourne’s culture. 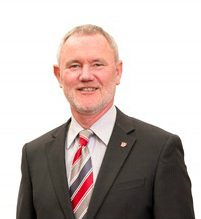 Mr Walker said: “Major Brendan Nottle of the Salvation Army and Melburnian of the Year first proposed a values-based project for the city some time ago. “There are so many selfless acts that Melburnians engage in. By promoting them, our aim is to positively charge the good deeds of our community and encourage more,” Mr Walker said. To achieve this goal the first instalment of the ‘Melbourne Values’ project - the #WLDNMLBN (‘Well Done Melbourne’ in text-speak) campaign – will be launched on Melbourne Day with Network Ten providing content, media and social support. The campaign will be completely unbranded. Executive General Manager of Network Ten, Russel Howcroft, said: “I loved the idea of promoting the values we want to see more of in our city. “With #WLDNMLBN we’re creating a unique, sticky and fun way to recognise the good that flows through the homes, streets and laneways of Melbourne – and elevate it,” Mr Howcroft said. The #WLDNMLBN campaign was developed by integrated ad agency BWM Group Melbourne. The #WLDNMLBN campaign will officially launch during the Melbourne Day flag-raising ceremony on August 30 at Federation Square. MEET Melbourne’s mini mayor. Ebony Chiazor, 11, is ready to rule after beating hundreds of students to become the latest junior Lord Mayor. Helping the homeless and boosting city security are her two top wishes for the city that turns 179 this month. "I entered last year and thought it was fun. I tried out again this year and when they said my name, I was shocked," Ebony said. "I conquered my fear of talking in front of people. I'm pretty proud of that." She says Melbourne's biggest bragging right is its multiculturalism. Her dad, Maxwell, left Nigeria for Melbourne in 2001 and said the city had provided endless opportunities for his family of four. "Melbourne is wonderful, I'm so proud and so happy for my kids to grow up here," Dr Maxwell said. Later this year, Ebony will join Lord Mayor Robert Doyle for a day of official duties and help brainstorm ideas for Melbourne's 180th birthday next year. Now in its second year, the competition is open to students in grades five to seven and aims to educate Victorians about the city. 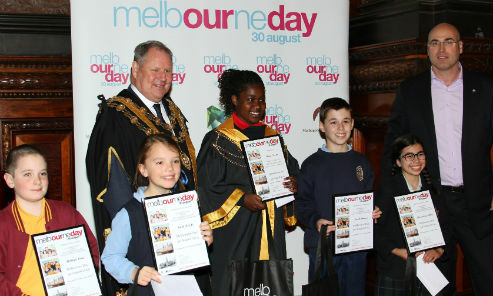 Lord Mayor Robert Doyle and Melbourne Day chairman Campbell Walker in the historic Melbourne Town Hall council chamber with 2014 Junior Lord Mayor finalists: William Long, Mill Park Heights Primary School, Mill Park; Sachi Debski, St Mary's Primary School, Ascot Vale; Ebony Chiazor (centre), Stella Maris Primary School, Point Cook; Jacob Browne, Our Holy Redeemer Primary School, Surrey Hills; Alexandra Lakkis, Penleigh & Essendon Grammar School, Essendon. This year's Melbourne Day birthday card and hat was designed by Amy Barnett, 9, from Our Holy Redeemer Primary School in Surrey Hills. 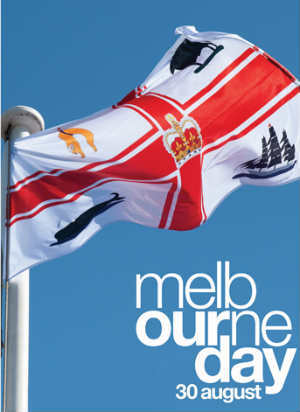 Her design is included as a pull-out in our official Melbourne Day program guide, distributed across Melbourne. It also forms an A3 fold-out hat that you can download, color-in and wear with pride on Melbourne Day! 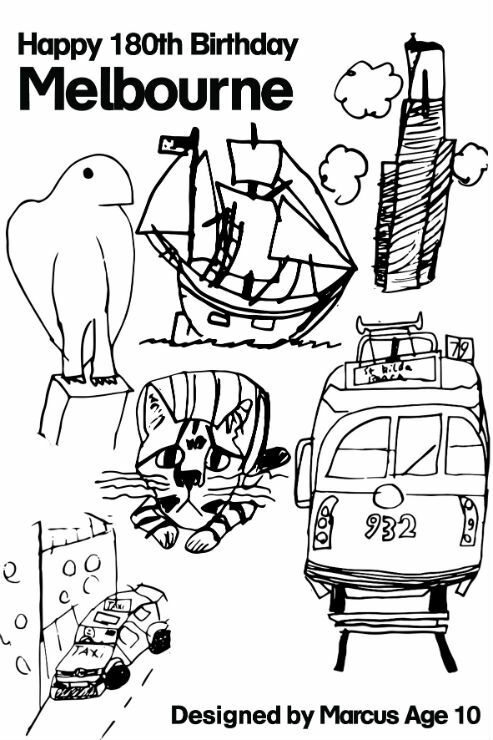 Amy won a primary school competition, drawing six Melbourne icons: turtles and fish at Melbourne Sealife Aquarium, Eureka Skydeck, Docklands sculpture Bunjil, tall ship Enterprize, Royal Melbourne Showgrounds' Pie In the Sky and Flinders St Station. Victorian College of the Arts students will transform Melbourne’s Windsor Hotel into a public gallery while vying for The Windsor Art Award, a $10,000 scholarship recognising Australia’s best emerging talent. Opening on Melbourne Day, 30 August, running until 14 September 2014, the Marvel exhibition and Windsor Art Award will be judged by a prestigious panel including Heide Museum of Modern Art director Jason Smith and artist Julia DeVille. As part of a collaborative exhibition between the VCA’s School of Art and the landmark hotel, visual art students will install works that are conceptual and material interpretations of the theme Marvel. The installations will feature in many of the hotel’s unique spaces including the heritage listed lace iron lifts, Victorian windows, renowned tea room and even a once-secret hotel entrance. The Head of the VCA School of Art Jan Murray said the partnership with The Windsor presents a unique opportunity for honours and graduate students to offer their interpretation of the city’s history and experiment creatively in a new environment. Adipoetra Halim, Hotel Director of the Halim Group, owner of The Windsor, said he was thrilled to show the hotel’s ongoing support for philanthropy and the arts by awarding some of Australia’s greatest emerging talent. “The Windsor is synonymous with Melbourne and the opening of Marvel on Melbourne Day is one way in which we can pay tribute to our vibrant city and “Marvellous Melbourne,” he said. The exhibition highlights the partnership between two of Melbourne’s most cherished institutions that share a combined history of more than 280 years. In 2017, the VCA School of Art will celebrate 150 years since the establishment of its predecessor, the National Gallery School. Established in 1883, The Windsor is Australia’s oldest Grand hotel and is one of the world’s most revered hotels of Victorian architecture. In the media: The Age interviews Harold Mitchell, 2011 Melburnian of the Year. Read it here. 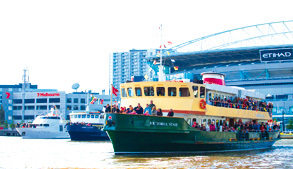 In the media: Melbourne Regatta article in Docklands News. Read it here. Toot if you love Melbourne Day - and see our boss' Jeep. You can't miss it. 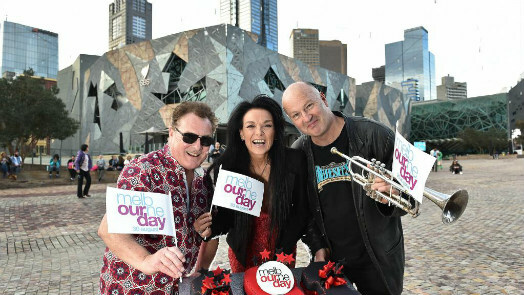 Chairman Campbell Walker's "Melbourne Daymobile" is back on the streets to help promote August 30 celebrations. Students in the city's inner east are learning about early Melbourne in a unique way: from senior students – from another school. Two Year 10s from Whitefriars Secondary College in Donvale, Melbourne's east, have commandeered the chalkboard and are making history come alive for younger students at Our Holy Redeemer in Surrey Hills, the city's inner-east. Ben Galtieri and Callum Thorburne are engaging the junior students by using a hands-on, one-on-one approach, helping history leap off the page and into the children's imaginations, says Liz McIntyre, the deputy principal of Our Holy Redeemer. The children are learning about the significance of Melbourne Day, the first settlers who sailed here aboard the Enterprize, and some of today's city landmarks, including Flinders St Station, Bunjil Docklands sculpture, Eureka Skydeck and Pie In the Sky at Melbourne Showgrounds. Ms McIntyre says it is part of Ben and Callum's community service program, and an "outward facing" approach to education, where schools and community work together. It helps produce a richer outcome for everyone, she says. 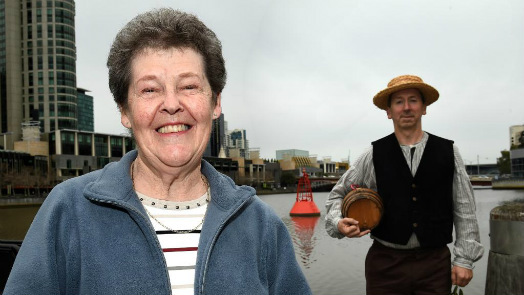 "The two have planned and organised time to teach the children about Melbourne icons. The boys are working with children from each grade, helping them learn more about the city and helping with entries in the Melbourne Day competitions." Ms McIntyre says under the outward facing model resources, accountability and responsibilities are shared. "Everyone experiences a sense of belonging and helps achieve a positive outcome," she says. 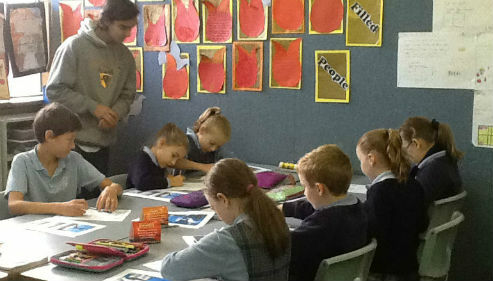 Ms McIntyre is also the school's student wellbeing leader and student services leader. 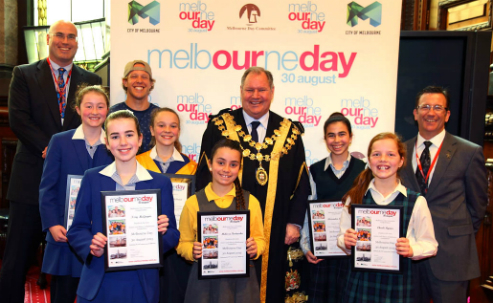 The winners of this year's Melbourne Day competitions to be the Junior Lord Mayor and design the official birthday card will be announced ahead of Melbourne Day on 30 August. See more photos from the classroom in our Melbourne Day Flickr photo gallery. Entries have closed. The 2014 little big boss of Melbourne will be announced soon. Five awesome finalists are chosen to meet a judging panel, with one overall winner decided. The Junior Lord Mayor helps the Lord Mayor raise the flag on Melbourne Day and fulfill mayoral and other official fun duties. The free competition is for children aged 10 to 13. Get our newsletter and be reminded next year. Listen to reigning Junior Lord Mayor Abigail Dinan's awesome interview on Neil Mitchell's 3AW radio show, with Lord Mayor Robert Doyle (17 July 2014). Maya Kimpton, 11, from Ascot Vale Primary School, is our 2013 birthday card and hat design competition winner. Maya’s was a standout entry, with great detail in the outline of the Enterprize, Melbourne Aquarium penguins and landmark Arts Centre spire. Her design becomes the official Melbourne Day 2013 birthday card and fold-out hat. 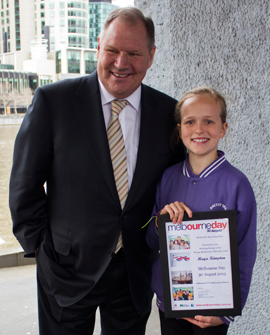 Maya is pictured with Lord Mayor Robert Doyle. 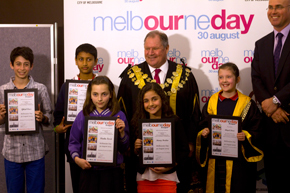 Thank you to all those students across Victoria who entered the 2013 Junior Lord Mayor of Melbourne competition. The entries flowed in with many schools submitting an entry from all students in each class. 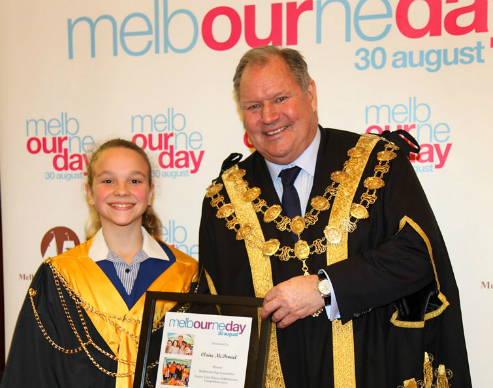 The Melbourne Day Committee along with Melbourne Lord Mayor Robert Doyle are delighted to announce the winner of the 2013 Melbourne Day Junior Lord Mayor of Melbourne is Miss Abigail Dinan (Stella Maris Primary School, Point Cook). 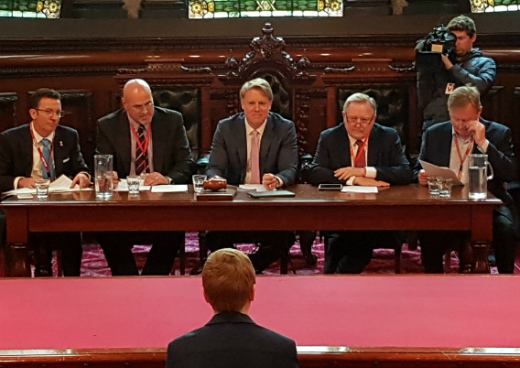 Abigail attended the Judging at Melbourne Town Hall on Monday 26 August to join all finalists to answer a few questions by the judges. Abigail will receive the honour on Melbourne Day Friday 30 August 2013 to raise the City of Melbourne flag with Melbourne Lord Mayor Robert Doyle and Melbourne Day Committee Chairman Campbell Walker. 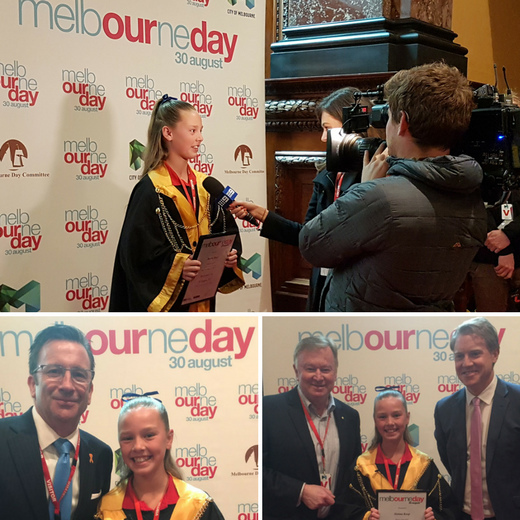 The Junior Lord Mayor will also join Lord Mayor Robert Doyle on mayoral duties later this year, be presented with a framed certificate and a prize pack of family passes to the Melbourne Aquarium, Eureka Skydeck, Medibank Icehouse and the Ministry of Dance. Thank you to the official judges of the Junior Lord Mayor competition, Lord Mayor Robert Doyle, Melbourne Day chairman Campbell Walker, CEO of the History Teachers Association of Victoria Richard Smith, Associate Director VET at William Angliss Institute Dan Mabilia, Reporter Jacqueline Felgate from Channel 7, Director of Fundraising, Marketing and Communications at Melbourne City Mission Sue Parkes and presenter from Channel 7’s Coxy’s Big Break Lee Chan. 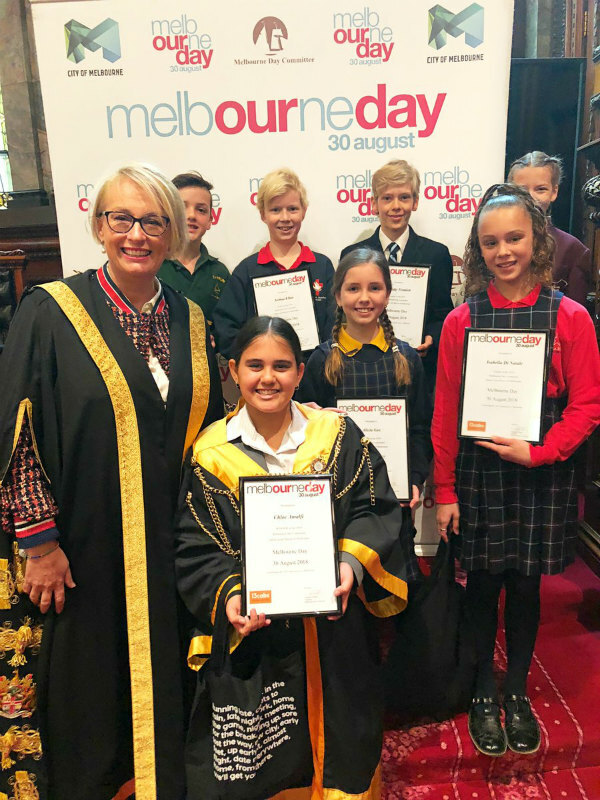 Congratulations to the following students who were finalists in the Melbourne Day Junior Lord Mayor of Melbourne Competition. You all did a great job with your entries and your presentation at the official judging. The Comics Lounge will come alive on Melbourne Day eve. Melbourne’s home of comedy, the Comics Lounge, will once again host our annual Laugh Out Loud Party in true party spirit. Come along for a night of laughter and fun. Enter for free tickets. Only 178 tickets available - to celebrate our city's 178th birthday! Pubs, clubs, cafés, restaurants, retail and city attractions want you to get the presents this Melbourne Day. The city will come alive with special offers, two for one, or maybe happy hour at your favourite watering hole. Come join the party and celebrate on Friday 30 August. For participating venues click here.